That Villain is Really Very Funny! 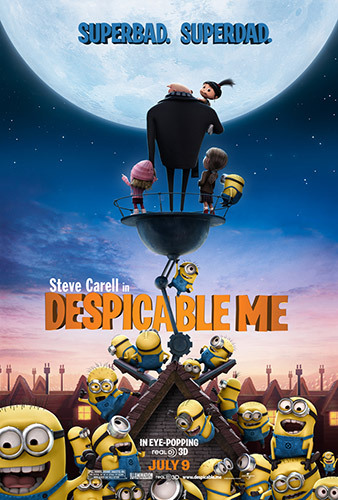 Parents and kids will enjoy sitting through Despicable Me as the main character is hilarious and the script is fantastic. You’ll be entertained from start to finish as this is a villain like no other. He loves his bad ways but quickly changes when three little orphan girls enter his world and would like nothing better than to call him dad. Universal Pictures is the studio of this CGI feature, which is available in 3D. It’s an original story by Sergio Pablos who is also one of the producers. Chris Melendandri (Ice Age, Dr. Seuss’s Horton Hears a Who!) is the main producer. The screenplay is penned by Cinco Paul and Ken Daurio. Steve Carell stars as the voice of Gru a CGI created villain that has a pointy nose, very thin legs and a squatty body. He’s a silly looking guy who lives in a quiet suburban neighborhood where you see white picket fences and lots of colorful flowers. Gru’s house is painted black and surrounded by a dead lawn. His basement is a workshop where he has created hundreds of small little yellow creatures called minions to help him with his mischief. The minions are funny looking as well, their bodies are shaped like tennis balls and they wear goggles over their eyes or eye (they vary in that department). 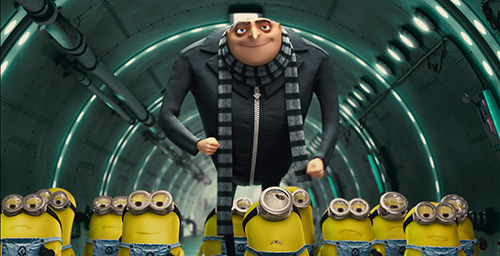 The minions are Gru’s cheerleaders, worshipers and helpers in villain activities. Gru’s latest and most devious plan is to steal the moon with the help of his elderly scientist, Dr. Nefario, voiced by Russell Brand. Other voices are Julie Andrews as Gru’s mother, Jason Segel as another rival villain and Kristen Wiig as one of the orphan girls. As the film opens, we view Gru freezing people with is freeze gun in order to jump in line at the local Starbucks. He also pops little kids’ balloons. His villain bank is refusing to give him more funds to continue his villain deeds unless he can bring in the new shrink gun that every villain longs for. Gru’s archrival has the shrink gun and with the help of three little orphan girls a plan has been put in motion. What Gru doesn’t foresee is the fact that these three little girls will melt his heart and turn his evil/villain world into one of ice cream, roller coaster rides and bedtime stories. The jokes are fresh and very funny. 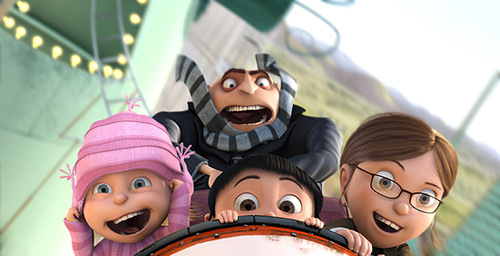 Gru is a likable, lovable villain whose accent adds to the wackiness of the script. He’s just oddball enough for kids and parents alike. I viewed the film in 3D and enjoyed the extra dimension, especially during the roller coater scenes. A scene I found especially comical was when Gru announces his latest villain activities and produces the Statue of Liberty; he declares, “It’s the small one from Las Vegas!” Very clever and funny stuff that made the audience roar! I have to admit I liked the film better than Toy Story 3 and can see a sequel in the making. And, according to IMDB.com Despicable Me 2 is set to come out in 2013. You can be sure this critic will be attending!